Islands scattered chaotically off the north and west of Scotland. Hopeless geographically but of great interest since it was one of the earliest printed illustrations of the Scottish islands. First edition published a generation before Timothy Pont's great survey. 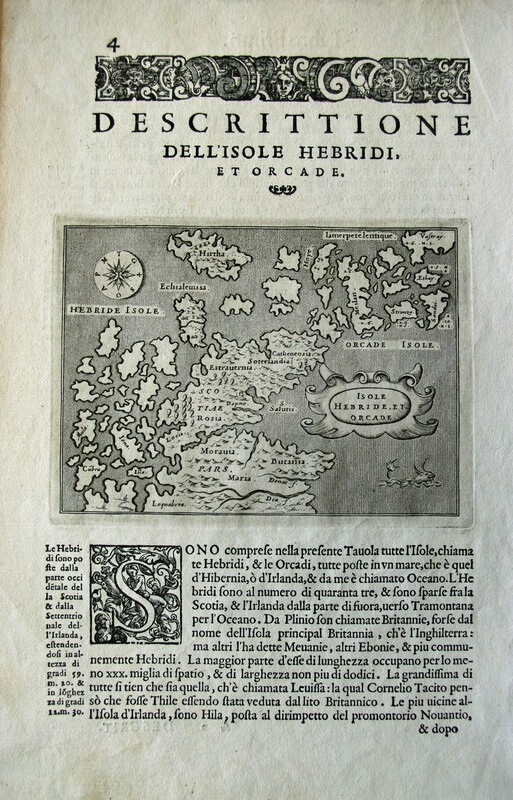 Italian text&semi; islands include Islay, Cumbrae, Mull, Hoy, Stronsay & mainland provinces and rivers. We also have a mounted version (in Conservation Grade Mountboard) at £215. In addition we have a coloured, mounted and framed version (in Conservation Grade Mountboard & Conservation Grade glass) at £299. Porcacchi did another map of the whole of Scotland which has considerably more detail. In the sea he has a little image of a galley. Had he heard of the fleets of West Highland galleys - 180 of which sailed or rowed to Ireland in 1545? We have an example of this map mounted in Conservation Grade Mountboard at £215.